Deadlifts are arguably one of the best exercises to strengthen your core, legs, back, and glutes – hello, booty. A common way to perform a deadlift is with a barbell, but if you’re new to strength training, you’ll want to start with something a little easier in order to get the form down. To help you perfect your form, Michael B. Jordan’s trainer Corey Calliet showed me a Romanian deadlift variation to teach you the basics. Adjust the carriage so that it’s at the bottom of the cable machine. Attach a triceps rope handle to the pulley on the carriage of a cable station. You should be facing the pulley. Next, select the amount of resistance you want – 20 to 30 pounds is a great starting point. As you begin to become more comfortable with the movement, feel free to increase the weight. Facing the pulley, grab the rope, and step approximately three feet away from the machine. With a slight bend in your knees, slowly bend at your hips (this is a hinge movement pattern) as you simultaneously extend your arms forward. Your core should be engaged, and your back should be flat. 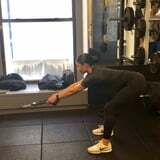 Then squeeze your glutes to stand back up as you simultaneously pull your elbows back (like you’re performing a bent-over row). Pull with power, and continue to squeeze your glutes at the top to get full hip extension. Be sure to keep your core engaged. This counts as one rep. Complete four sets of 12 reps.